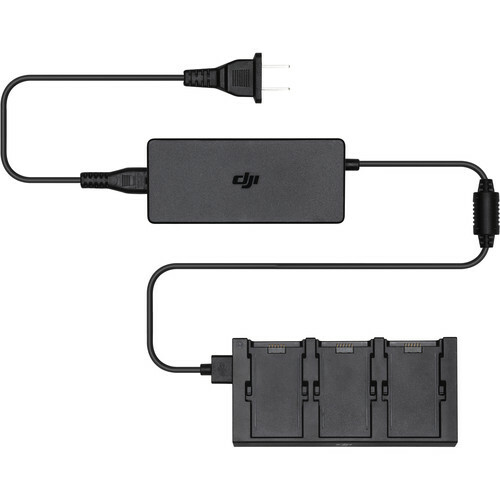 The Battery Charging Hub for Spark from DJI is designed for use with the Spark Intelligent Flight Battery. It can charge up to three Intelligent Flight Batteries. The Intelligent Flight Batteries will be charged in sequence or simultaneously. The hub optimizes charging based on batteries' power levels and cell voltage. As an added safety measure, when battery temperatures are low, the Charging Hub will limit the charging current to prevent a hazard and prolong battery life. Battery Charging Hub for Spark Quadcopter is rated 4.9 out of 5 by 12. Rated 5 out of 5 by Birds Eye Bill from B&H - My GO TO Guy For DJI Gear! Let's get down to it... buying DJI Gear can be a real challenge when dealing directly with DJI. To avoid the hassle, I reach out to B&H, my GO TO GUY FOR DJI! Friendly, helpful, courteous sales staff, great product availability, honest pricing and FAST delivery. Oh yeah, and there is also U.S. help if you need it! Avoid the hassle, enjoy your DJI technology, and get back in the sky quicker! Take it from Birds Eye Bill - If you like to fly, see my GO TO GUY for DJI - B&H Photo! Rated 5 out of 5 by Andre from Great Charger Awesome that you can charge 3 phones at once and also the Remote Controller with the usb port. It charges way faster than just charging the battery in the Spark. Get it! Rated 5 out of 5 by Fathalla from Wonderfull charging Awesome that you can charge 3 phones at once and also the Remote Controller with the usb port. It charges way faster than just charging the battery in the Spark. Get it! Rated 5 out of 5 by Stanley from Necessary accessory. Platter charges three batteries and the converter has two USB ports where you can plug in the remote controller and your pad, pod, or phone! Rated 5 out of 5 by Farid from Perfect The charger is working perfectly. It is charging 3 batteries and, remote control and the phone at the same time. Rated 5 out of 5 by Clif from Convenient This hub works great as expected keeps you from charging thru the drone itself.